All living beings are made up of tiny, microscopic units called cells. Some, like primitive organisms found in ponds, consist simply of a single cell. 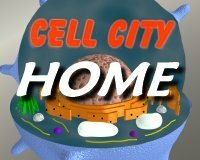 Others, like we ourselves, start life as a single cell but grow into a vast complex of many different types of cell, with each cell performing a specialized function. Towns and cities vary greatly in size. Nevertheless, whatever country they are in, they all have many similar features. Likewise, despite the great variety of life forms and cell types, all cells have many features in common. The same basic structures and organizing principles apply equally well to cells in plants, for example, as they do to cells in humans.